First, let me apologize for not posting on my blog and my youtube channel for the last month. I am in the process of selling my home. So due to having multiple showings throughout the day; IF I get a chance to sit at my PC and type I'm lucky! So about three weeks ago I order a BCC E38 Brow Finisher brush as a gift for a friend who bought brow pomade and decided to use an eyeshadow brush to fill them in with. Needless to say, her pomade was not applying well. So I figured I surprise her with the E38 brush that works wonders for filling in eyebrows with just about any eyebrow product! About a week later after ordering the brush I went to retrieve the mail when I noticed a rather largish package from BCC. At first glance I wondered if I had accidentally ordered something other then the Brow Finisher brush as the package was way to big to warrant for a brush that small. Upon entering my house I grabbed a pair of scissors and ripped open the parcel. To my maximum surprise I realize that BCC had sent me as a gift their new Pippa Palette that just came out! I was totally shocked!! I had seen the palette the day it came out and wanted it so badly, but due to selling my old house and buying a new one...lets just say "money ain't flowing the way it use to" at least not right now with all the real estate fees. So I figured I would eventually get the palette once I moved into my new home. However when I saw that BCC had sent it to me as a gift, I was beyond elated by this wonderful gift. The palette is truly gorgeous. It comes in a love pink packaging with a very useful (no fun house) mirror. It has six eyeshadow shades, a blusher, bronzer and highlighter all in one. The eyeshadows are all neutral mattes. Now when I say matte, I don't mean those nasty chalky matte eyeshadows that have fallout all over the place. I am talking about those nice matte shadows that look almost like they have a sheen to them but don't at the same time. Since the palette is neutral, just about every skin tone can use it. 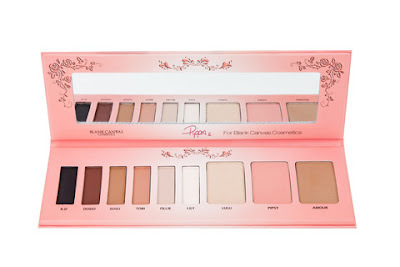 Moreover, you can rock day and night time looks with this one palette. due to its neutrality, its very versatile for an everyday look and wear. The best part is that its an all in one palette. The only other palette I have like this is from Tarte which I love because its great for traveling. Since the Pippa palette comes in a cardboard case, it great for travelling and well protected from damage in your bag. The fallout in this palette was basically none. BCC did a great job in tackling this issue with their matte colors. Matte colors tend to have a lot of fallout, but in this palette I had no issues whatsoever. Even when I applied the black shadow in the outer part of my eye, I had no fallout underneath my eye. The colors blend well and work amazing with each other. So you won't find the random "this sticks out" colors in this palette. This palette really surprised me in its look, feel, pigmentation and blendability. The blusher is a beautiful rosey shade that is highly pigmented. I learned that the hard way when I applied to much. A little really does go a long way. It really leaves your cheeks with a natural rose finish. The bronzer has a light brownish undertone. I would of preferred a grey undertone, however this one work wells. Its not red or orange in its undertone so just about any skin tone can use it. The bronzer looked lovely on my fair complexion without looking muddy, dirty or over the top. The highlighter is totally to die for. It is completely pigmented, very visible when worn but lacks shimmer in it which works great to not let you look like a disco ball. I don't really like shimmer or sparkle in highlighters as they come across fake and totally over the top. So this highlighter was just beautiful. All the names of the colors on the palette were personalized by Pippa who is a model and a makeup artist. I found that part truly touching as she named each color after either a person, beloved animal or nickname from her life. Its interesting to be able to see a bit of a persons life in the products they make. I have worn this palette non-stop since I got it and every time I wear it, people always comment on how amazing the colors look. I will be doing a Youtube channel showing swatches of each color. I would totally recommend picking up this palette before it discountined as it is a limited edition! So truly, thank you BCC for this lovely gift. This is now my traveling palette as well due to its all in one functionality. FTC: While this palette was sent to me by BCC as a total surprise, I was in no way paid for my opinion and my thoughts are totally my own! !